As recent polls indicated, classic Whalers in the 16/17-foot range are the most common. They are also most likely to be powered by OMC outboards. And when not on the water, they are stowed on a trailer. And true to the desires of most Classic Whaler fans, they have plenty of wood on them. Not surprisingly, my mailbox was full of boats that fit that description perfectly! Here is a look at several boats with those characteristics. "I bought this boat from a dealer in Mt. Pleasant, South Carolina, in June. It apparently was purchased at Killinger Marine in Pensacola. I kept their sticker on. 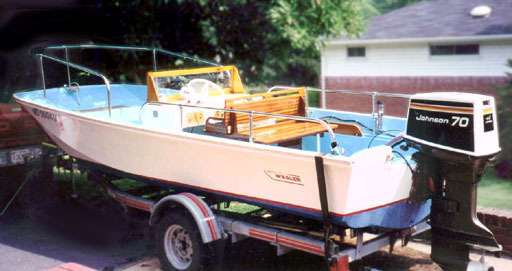 When I got the boat it had been kept in the water, the rails were rusty, and the gel coat was badly faded. 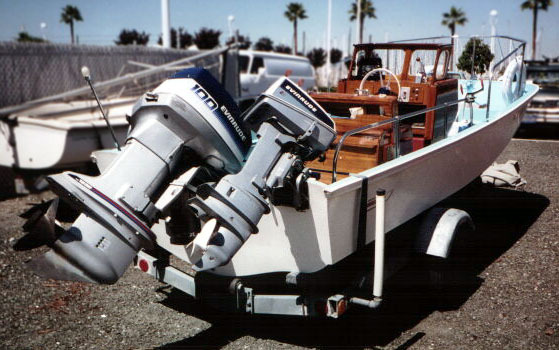 The teak had not been cleaned in years and the 1989 Johnson 88-HP outboard was history. 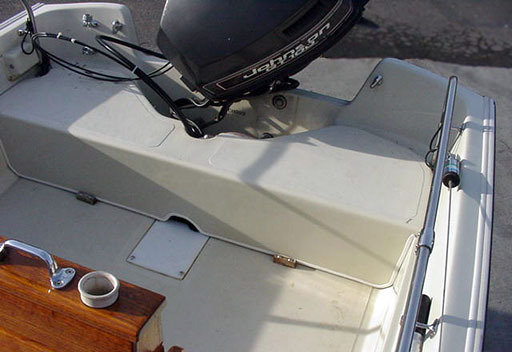 The helm seat was shot, the two aluminum gas tanks were in poor shape and leaking gas, an old Coleman cooler was in the front with non-factory cushion. and no rod holders. The electronics were rusted and broken. I got all new upholstery from Dave's Custom Upholstery, a new float on aluminum trailer, new radio and fishfinder, a new 2000 Evinrude 90hp Ficht engine, and put in a 92-quart Igloo in front (which I am using for storage) and a 120-qt in back for beverages . I have ordered rail-mounted down riggers. "This photo was taken at Lake Lure, North Carolina in August of 2000. I am the Captain and my son Steve Warren is on the cooler seat with his wife Heather. (Steve has an 1986 Montauk and a 1988 Revenge-22 in Mt. Pleasant.) This Montauk has since been in Lake Jocassee, Lake Kewowee, Lake Murray and in the rivers and creeks around Georgetown and Pawleys Island." 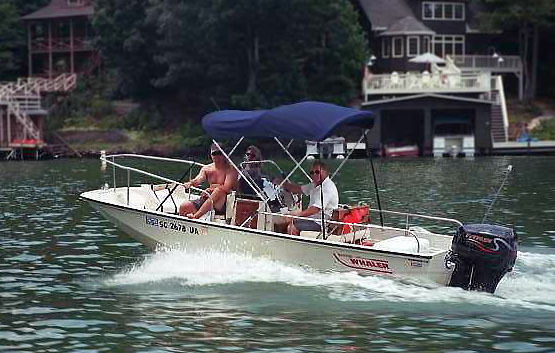 Just taking a spin around the lake might be one of the most popular uses for a Montauk. Newer Evinrude power and a dark blue sun top dress up this beautifully restored classic Whaler. Steve Scruggs sent these interesting shots of the interior of a Montauk he used to own. He wanted to show the nice molded cover, but what caught my eye was the beautiful varnish on the reversible pilot seat. Whomever Steve sold this Montauk to got a fine example of classic Whaler. "I just sold my 1988 Montauk. It had a unique rear cover and seat that hid all the battery, oil tank, fuel filter, and other hardware. Have you ever seen one of these? I understand that our local dealer, Jacobsen's, fabricated them during the late eighties. This cover was very practical." This molded cover hides much of the hardware and cable in the stern of the Montauk. Apparently custom molded by a Whaler dealer, the current availability of this accessory is unknown. Would you like one for your Montauk? Dorsey Shaw of San Francisco has been keeping his classic 1968 Whaler 16-Sakonnet in "immaculate condition." The wood components are all original. The Sakonnet was the top-of-the-line of the Nauset/Eastport/Sakonnet progression of models. "A photo of our 1972 13-Sport in action. Purchased in 1999. 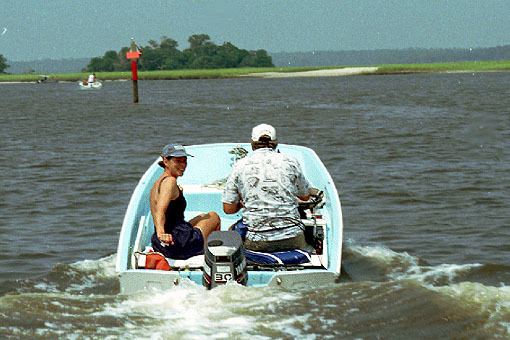 Operated in waters around Southport, NC. Replaced all wood with Starboard. 35-HP Yahama. Restoration in progress, but we plan to stay with the starboard. Can't imagine selling her." There is hardly a boater alive who would not enjoy taking a classic Boston Whaler out for a ride in protected, coastal waterways. There is something about being so close to the water that makes boating in a Whaler more fun. 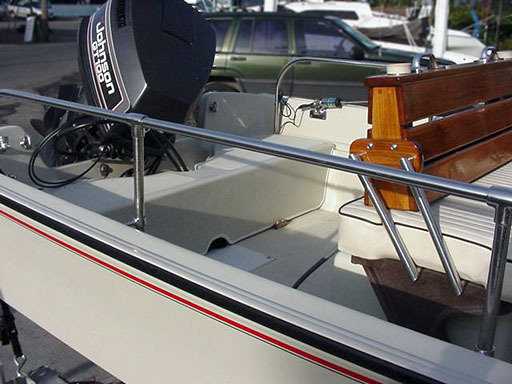 "Here are some pictures of my Minot model Whaler. I apologize for the lack of water around the boat and for the lack of good perspective. It is currently 8 degrees outside, the ground is snow covered and the boat is wrapped up for the winter. I will send you some better shots in the spring when I start using the boat again. These pictures are from August of 98. "This Minot has spent all of its life in Maryland. We use it to go water-skiing on the Potomac river in Hagerstown, Maryland and we take it fishing in the Chesapeake Bay mainly on the Wye and Choptank rivers. Occasionally, we take it fishing in Chincoteague, Virginia. Mr. Novotny kept it in the water and that explains the painted bottom. It now is on a bunk-style trailer whenever it is not in the water. "The only problem I have ever had with this Whaler is the tendency of screw holes to become enlarged to the point that the screws will no longer hold. This has only been a problem with screws that hold the console in place and screws which hold the rails in place. Whenever this happens, I drill out the hole with a 1/4 inch bit, going only as deep as the screw goes, and I use epoxy to glue a piece of 1/4 inch hardwood dowel into the hole. When the glue is dry, I redrill the hole for the screw and put it all back together. With this method, I have never had to redo any hole that I have fixed. It works great! "Last summer, I completely disassembled the seat in this boat. I got it to the point where it was just a bunch of pieces of lumber. Then, I stripped everything and refinished it. After sanding was complete, I used Interlux paste wood filler to fill the grain of the mahogany. Then, I put on 5 coats of Interlux Schooner varnish. It gave the wood a really nice golden color. It was a tremendous amount of work but the end result was worth it. I also refinished the windshield but because of the way it is put together, there is no way to take it apart without destroying it." The Minot was just below the Katama in the model hierarchy. It lacked the windshield of the more expensive Katama. 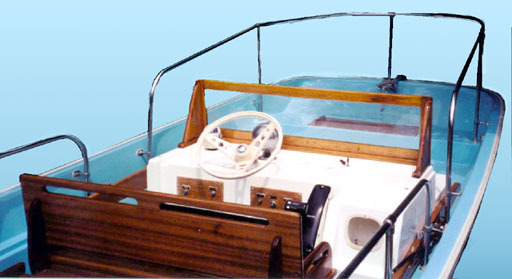 This boat was upgraded by the original owner with some wooden additions, including a bench helm seat. 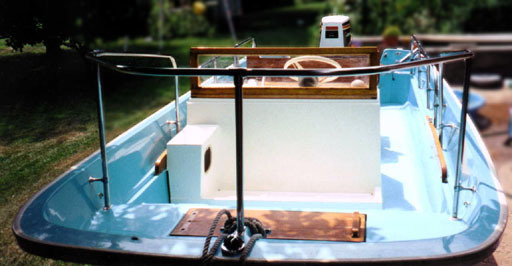 Another classically rigged trailer set-up: keel rollers and gunwale-to-gunwale hold down strap. The blue bottom paint with red waterline stripe is a nice added touch to the boat's color scheme. The wooden windshield is clearly an add-on, but nicely done. The original molded bench seat has been removed and replaced with this wooden version, another well-crafted addition. This is either a Boston Whaler original Nauset pilot seat or a darn good copy of one, with a rear facing seat added. There you have it--the results of our Whaler Voting Booth (a reader poll taken prior to publishing this article) are reflected almost exactly by the contributions showing up in my mailbox. The funny thing is that I assembled all these pictures for this segment of CETACEA without realizing that they were precisely as categorized by the survey! It was only after I had made up the page that I realized how true to the polling results it was. For more information on the 16-foot and 17-foot hulls in the classic Whaler line visit the Reference section.